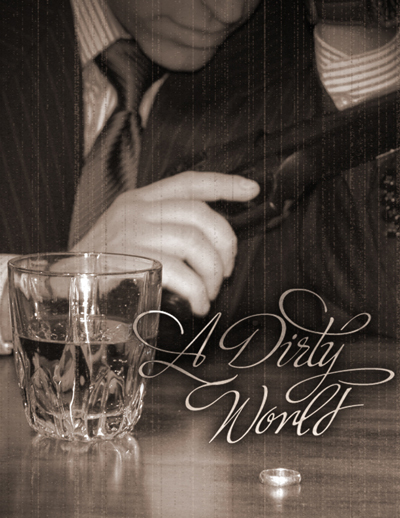 I picked up Greg Stolze’s Film Noir inspired game, A Dirty World at Gencon this year and ran it for the first time recently. Inspired by material I had read from Reefer Madness about the meat packing industry and a recent article in Wired about Picher Oklahoma, I whipped up a quick neo-noir scenario based on a Superfund buyout. The players find themselves opposed to each other as everyone wants the land for their own reason. The small town of Arcadia Kansas is about to become a very dangerous place…that is you want in on the buy out. The moment I heard Aaron’s voice and “Film Noir” I knew this was going to be fun. Good luck Boy Scout. So, a potential sequel with a pissed off widow, and Tom burning down all fancy dress stores before he starts? This was a great AP – I loved how Aaron could not roll to save his LIFE. Fantastic AP! The best in a while (and considering the quality of the APs, that’s saying something). I bought my copy of Dirty World right after I finished listening. And welcome Caleb. You’re a great RP and in excellent company. I thought it was good aside from two things. One killing tom in the end didn’t make much sense other than to just kill him off for killing’s sake, it also seemed likt the whole time his character was trying to be steered somewhere to get him killed. The bigger complaint/question. The masked guys in the old man’s home…Apparently thy were hired to kill the geezer before he was ever able to sell his land to anyone? That doesn’t make much sense. If he dies its not going to be sold to Susan, so no one would make any profit. Thus leading me to believe whe Tom didn’t go to the mine and decided to visit him to probably broker the deal, Ross seemingly threw them there to trying and steer Tom towards the mine and his eventual death. Also….I knew Tom was a good rper before, but man was he an amazing lawyer! and citizen Cohn along with everything James Woods is in is great. Killing the old man was an act of desperation – The meat packing plant did not want the government to buy the land and clean it up because it would reveal the dead workers and waste illegally dumped by the plant. Since everything seemed to be going to hell, Susan ordered the hit, figuring his death would delay the sale long enough for her to figure out how to keep the government from buying it. Awww! Thank you, Mr. Gadfly! You’ve made my day. maybeso Ross. But the way i heard it Tom’s character agreed to work with susan and meet her, which was a flat out over the phone lie. And since he headed straight to the old man’s house immediately after calling the sheriff, which was immediatly after the conversation with Susan, it did not strike Me as well thought out on her part. Now it’s more than possible that i misunderstood what Tom was trying to do, but, and i know i should really suspend disbelief somewhat, it didn’t seem like there was near enough time for Susan to go to the mine realize Tom wasn’t coming, talk to Larry, and order the hit in that amount of time. I did fudge the timing a bit probably but Susan panicked because things were spiraling out of control. Caleb’s PC wasn’t playing along, the sheriff was looking into the situation and Tom’s lawyer was acting funny. Also, Tom was killed because the goons didn’t want anyone to know the old man was murdered and Susan wasn’t alive to order them to stand down. Oh and Tom wasn’t paranoid enough to go into hiding. Ross is secretly working to kill every one of Tom’s characters. Logic just gets in the way of that mission. Is Tom committing to playing more evil characters? I mean, I thought the thrikreen was starting to push the envelope, but a lawyer? God help us. Tom only wants to play evil and/or monstrous characters. That is his thing. Crazy game. I liked listening to everyone fight, Aaron complaining about Tom crushing his soul especially. I got alot of interference on this audio, was somebody making alot of phone calls during the game? Loved this one. listening to this is better than the tv these days. Reality TV sux, They should make shows with your RPG Podcast. Better Plot and acting. Thanks guys. Uh…yeah please don’t kill me. I enjoyed this one a lot. Though the first session with any rules set is a little rougher, it’s also useful as a listener. It’s a good chance to see which rules and concepts trip people up, even if they are familiar with ORE. I kept thinking that the mine would have some echoes of the Arcadia signal, but that really wasn’t necessary for things to go badly. The human scope of the evil worked very well for the game and ADW just doesn’t seem to like Aaron very much.